Delaware Theatre Company is in the upper echelon of Broadway-grade theatre in the Philadelphia area. 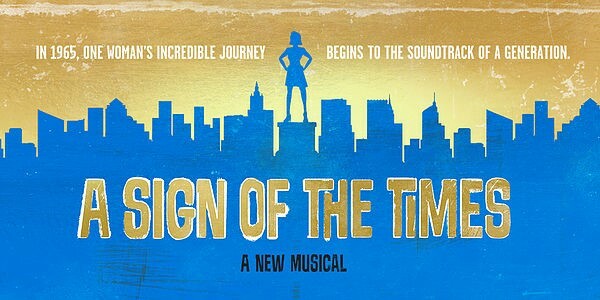 With a reputation for “out-of-town” try-outs, they produced the regional premiere of A Sign of the Times, book by Bruce Vilanch based on a story created by Richard J. Robin. Tagged, “In 1965, one woman’s incredible journey begins to the soundtrack of a generation.” Starring Broadway’s Chilina Kennedy (Carole King’s Beautiful) as Cindy, who plays a progressive female who wants to pursue her career ambitions as a photographer and not settle down to play Donna Reed. Think Mary Tyler Moore! Kennedy is a delightful artist who will continue to be a driving force in musical theatre. Vilanch’s interest in Petula Clark, sets the soundtrack to this jukebox musical. The music and orchestrations are top notch, the story, is utterly lackluster. With Vilanch’s Emmy Award for comedy, one would think there would be punchline after punchline, sadly, there wasn’t much to laugh at. In fact, the laughter that was present was often forced and predictable. Vilanch uses the political heat of the 60s, such as civil rights movement, women in the workforce, “Mad Men”, and war, which by any means is no joking matter so it’s no wonder the comedy was few and far between. In fact, it proved we are still very much dealing with the same challenges today, particularly regarding #metoo. It simply was a forced reason to intertwine the killer tunes of this generation but was never flushed out book-wise. There was some meat in there that could have made for a memorable story and that was a storyline of supporting character Tanya, as played by the impeccable show stopping actor, Crystal Lucas Brown (Lincoln Center’s Bull In A China Shop). Her character had more grit, more heart, and more of a backbone that when talking about this production with other contemporaries, we agreed that this was the story we clamored more for. An independent African American female living independently in the big apple while pursuing her dreams and maintaining a public interracial relationship with a deep-rooted past. THAT’s a story! Strip the show of its storyline and you are left with phenomenal musical numbers as choreographed by Joann N. Hunter and directed by Gabriel Barre; a stellar ensemble; principal players with impeccable voices under the musical direction of Joseph Church; a mesmerizing set from Paul Tate dePoo III with projections by 59 Productions; one remarkable costume after another by Jen Caprio. All of this adds up to Broadway status and why DTC is home to many, many productions looking to advance to the Great White Way. This cast and ensemble is filled with Broadway talent: Drew Seeley (Jersey Boys), Ryan Silverman (The Phantom of the Opera) are Lauren Boyd (Hamilton, West Side Story Nat’l Tour), Brad Bradley (The People in the Picture, Billy Elliot), Melessie Clark (After Midnight – Norwegian Escape), Steven Grant Douglas (Ghost – The Musical), Natalie Charle Ellis (School of Rock, Les Misérables), Stacia Fernandez (The Drowsy Chaperone, Mamma Mia), Phoebe Gavula (Cabaret – Arden Theatre Co.), Louis James Jackson (Motown), Sarah Jenkins (Cats), Aaron Kaburick (Hello, Dolly! ; Something Rotten! ), David LaMarr (Jersey Boys Nat’l Tour), Alexandra Matteo (A Bronx Tale, Annie), Ralph Meitzler (Something Rotten! Nat’l Tour, Rock of Ages), Nick Picknally (The Wizard of Oz Nat’l Tour), and Dave Schoonover (Love Never Dies Nat’l Tour, The Fantasticks). If you are looking for story-telling, I wouldn’t suggest this is the musical for you. But if you are looking to go to a concert and get a slice of life from 1965 with an out of this world orchestra, then A Sign of the Times is totally a 2 ½ hour ride worth taking. With only one week left, visit https://www.delawaretheatre.org/ for more info.